Katie Taylor is on the verge of a world title. 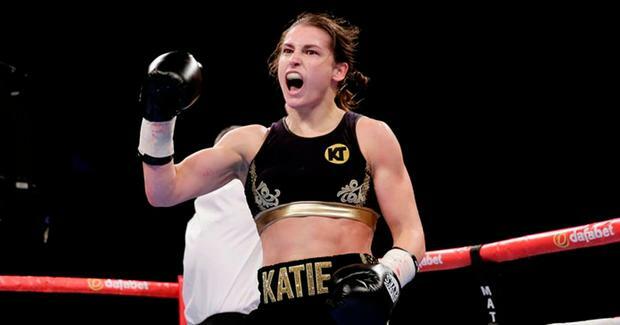 Katie Taylor has adopted a 'seize the day' mindset for her bout with WBA Lightweight champion Anahi Esther Sanchez at Principality Stadium in Cardiff tomorrow week. Taylor has progressed to her first world title shot in the pro ranks after six fights, following her final eliminator win at Wembley Stadium against Nina Meinke, on the undercard of Anthony Joshua's epic clash with Wladimir Klitschko in April. The Bray boxer tackles newly crowned WBA ruler Sanchez who became a two-weight champion when she stopped fellow Argentine Cecilia Sofia Mena in September. Taylor feels her world title challenge in Cardiff is the fight that can catapult her into super-stardom and mega-fights down the line. "Since the fight was announced the weeks have flown by," said Taylor. "There's an element of nerves for every fight. I've had the opportunity to box on big shows before but this fight, without a doubt, is going to be the biggest of my career and open more doors in the future. I cannot let this chance slip, which brings pressure but it's the type of fight I want. "I train for every fight like it's a world title fight. The great thing about this one is I've had a much longer camp. The last couple have been so close together. I've had a good few months preparing for this one. "When we first sat down with Eddie he wanted us to fight for a world title within a year and he's stayed true to his word and delivered. It's an honour to be fighting for the WBA title. I'm delighted with the progression of my pro career to date. "It's my first time at Principality Stadium - what a stage to be fighting on. Wembley Stadium was good preparation for this and I do love an Anthony Joshua undercard. This is more than a dream for me." Meanwhile, David Haye has acknowledged he will have to learn to stop being a "control freak" if he is to progress in his future career as a boxing promoter. The 37-year-old tonight oversees the professional debut of Rio 2016 Olympian Joe Joyce at London's Indigo at the 02 Arena, where the heavyweight will risk fighting the respected Ian Lewison. Haye has combined with Richard Schaefer to form Hayemaker Ringstar and, though he has officially promoted before, this latest venture comes with him widely thought to be heading into his final fights and pursuing a new path. "As these fights go on I'm going to need to let go a little bit, because I'm a bit of a control freak. "You're not in control: when it's my fights I know all I need to do is make sure I'm on point mentally, physically. When it's down to someone else being in good shape, you have to take their word for it, and assume that the people around them have got them in the best condition, haven't been up all night stressing about whatever it's going to be."